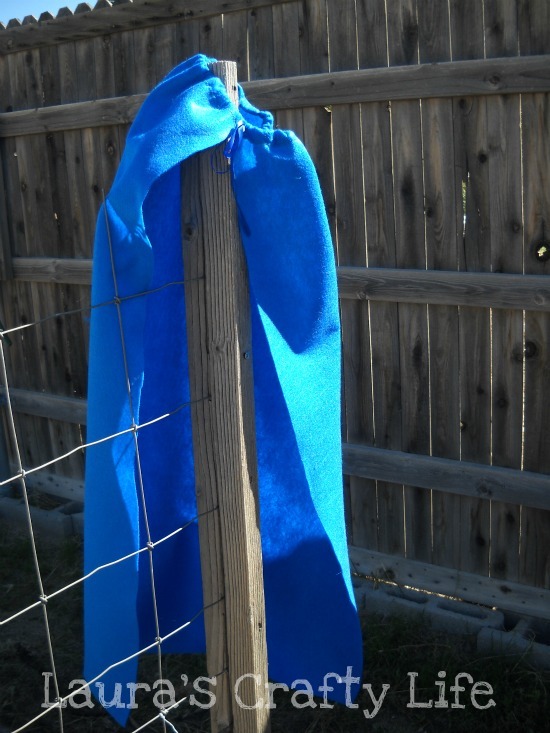 For my son’s Lego Batman party, I wanted to make capes for each of the kids that were coming. I needed this project to be inexpensive and relatively uncomplicated. I knew I wanted to use felt because you don’t have to do anything to the raw edges. So, a trip to Jo Ann’s was in order. 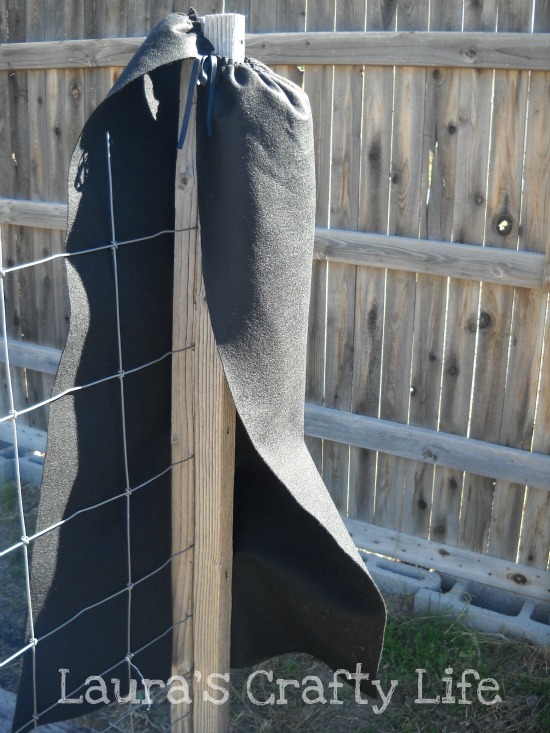 I ended up sewing the capes two different ways, and each was really easy. It took less than 10 minutes to sew one cape. It ended up taking me a little over 2 hours to make all 12 and that was only because my sewing machine and I were not getting along! 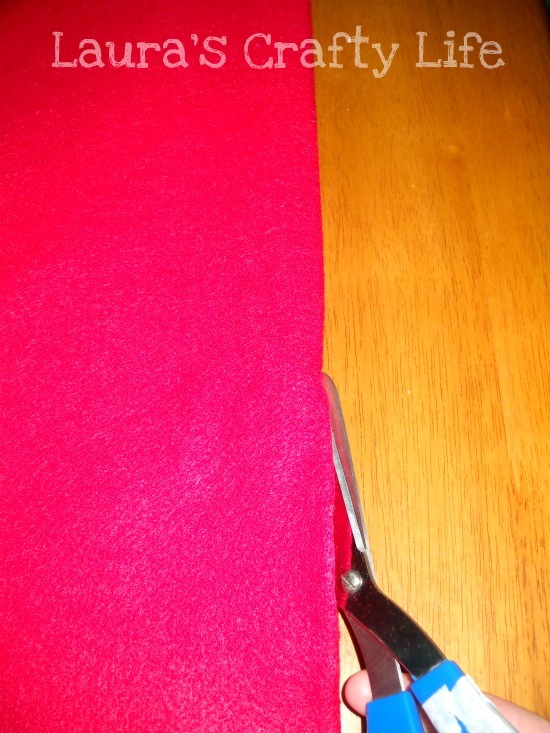 Cut your fabric to size. there from buying the fabric. Then I folded the fabric in half and cut. 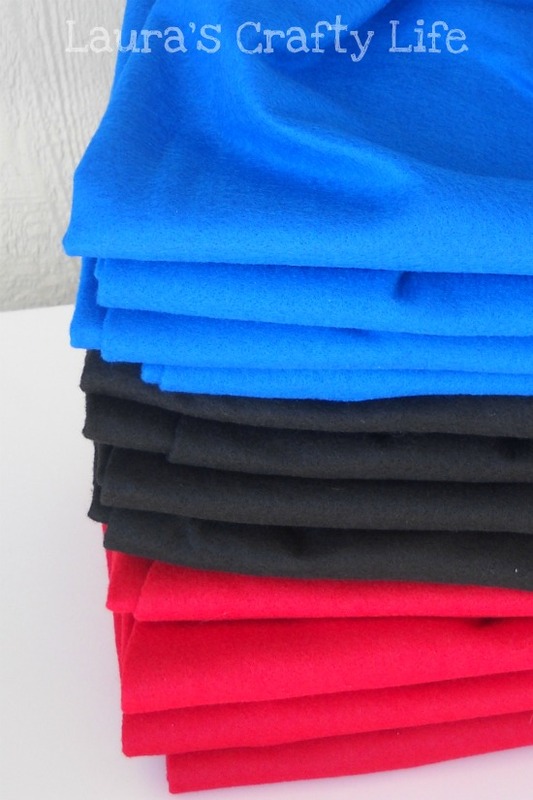 I purchased 1 1/2 yards of 72″ felt in each color (red, blue and black). 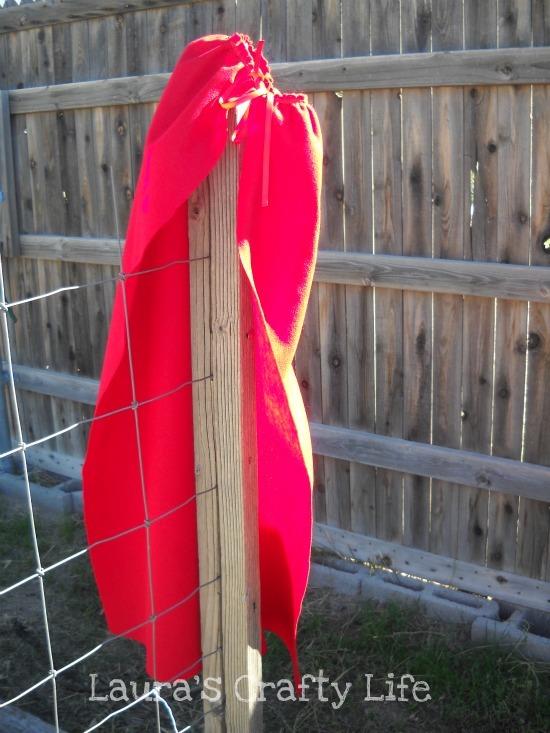 I was able to get four capes out of each piece of fabric. 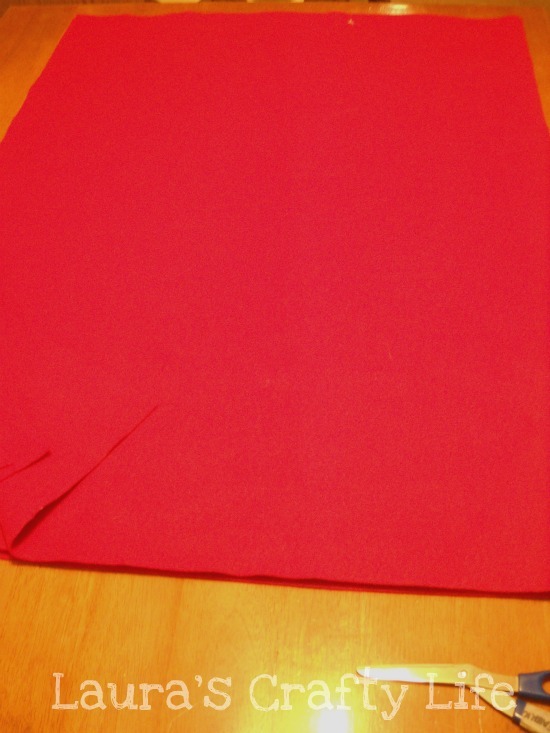 I cut the fabric in half lengthwise and then again widthwise to get 4 pieces of felt 27″ wide by 36″ long. 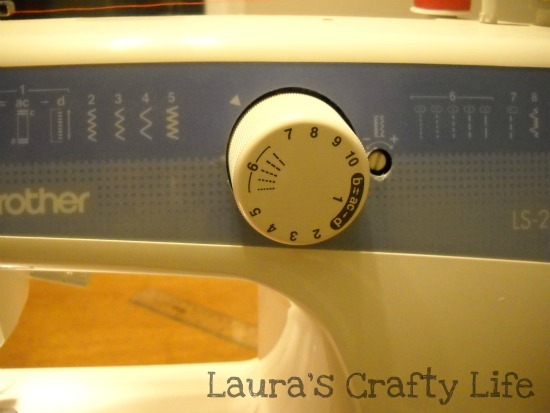 Set your machine to sew a straight stitch using the longest stitch possible. 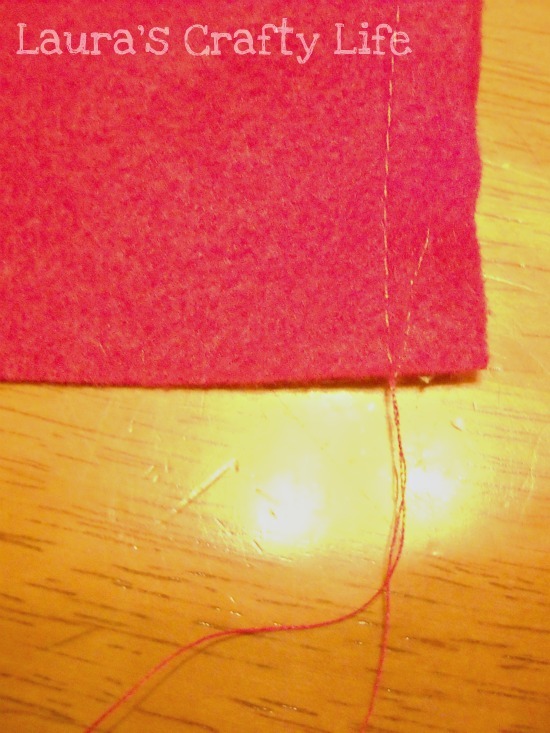 Sew a straight stitch about 1/4 – 1/2″ down from the top edge of the felt. Do NOT backstitch at the beginning and end! 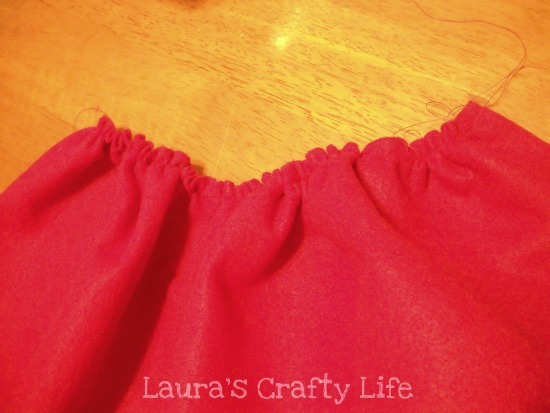 Be sure to leave 3 – 4″ of thread on either end of the fabric. At one end tie a knot with your loose threads from the top and bottom stitch. At the other end you will begin GENTLY pulling the top thread to create a gathered effect in your fabric. The fabric will slide along the thread as you pull. Once you have it gathered to your liking, tie a knot at that end to keep your gathering from coming undone. Find the middle of your piece of ribbon. Pin it to the middle of your gathered edge. 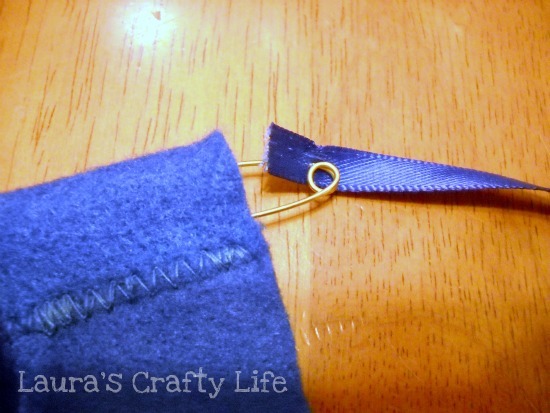 Pin the ribbon directly over your stitching you did to create the gather. You will work your way out either side pinning the ribbon to the gathered edge as you go. 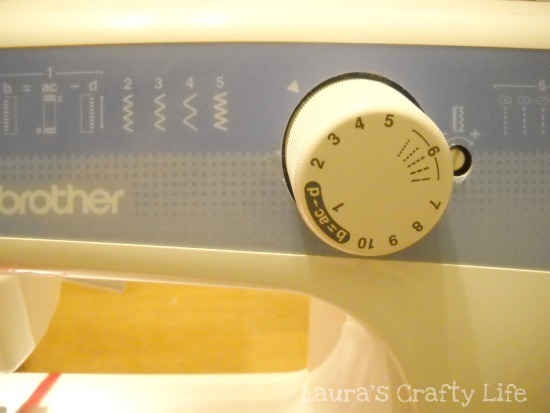 Set your machine to zig zag stitch. This is what the finished stitching will look like. 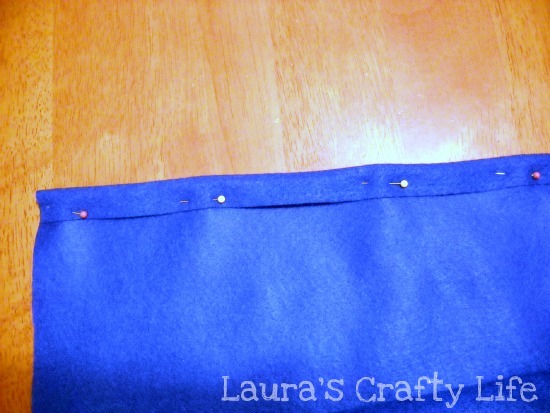 Pin a 1/2″ hem along the top of your fabric. (Do not fold the raw edge under). I eyeballed this and just made sure it looked straight. The main thing is you want to be sure you have a big enough pocket to slide your ribbon through. 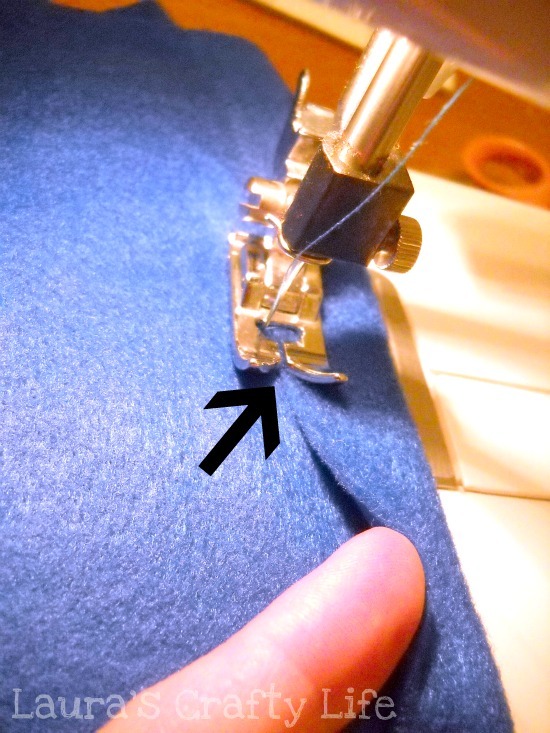 Set your machine to a zig zag stitch. 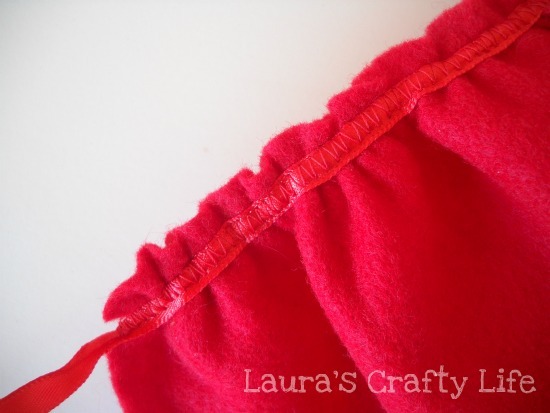 You will want to zig zag stitch directly over the cut edge. To keep everything aligned, I made sure that the hole in my presser foot was directly over the edge of the fabric. This will create a finished edge without having to fold anything under. 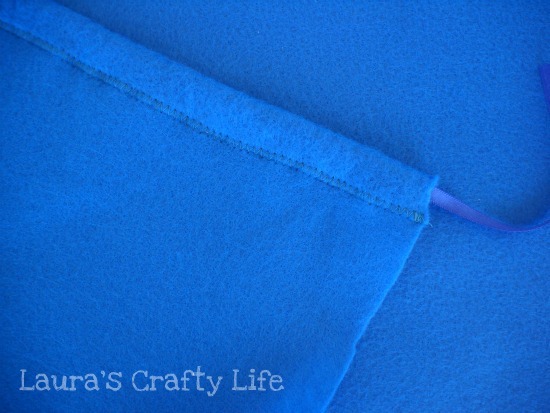 stitch completely covers the raw edge. 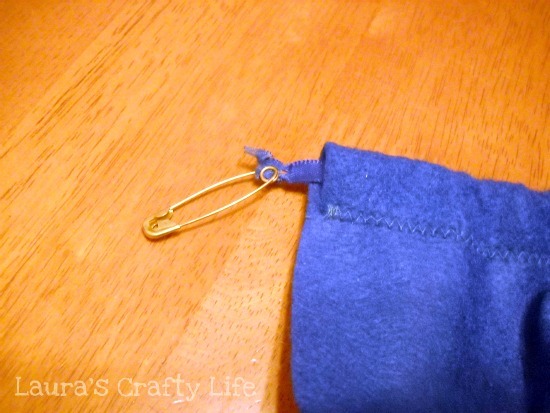 Slide your ribbon through the pocket you have just created. 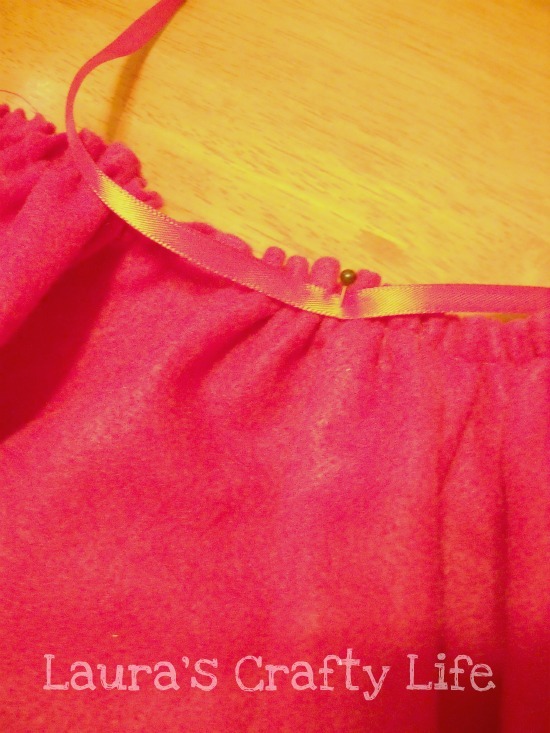 To easily thread ribbon through the hem pocket: Attach a large safety pin to one edge of your ribbon. 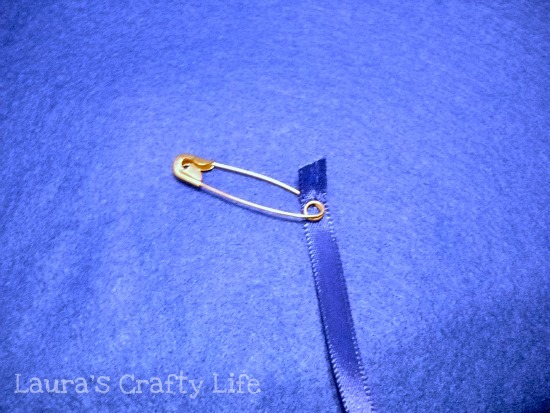 Grab the safety pin through the fabric and pull along the pocket until you reach the other end. 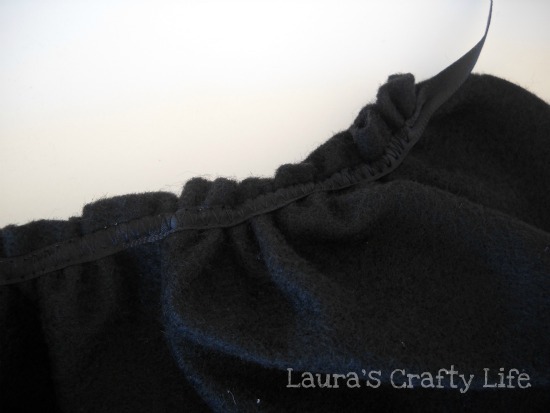 Be sure your ribbon is centered in the hem pocket. 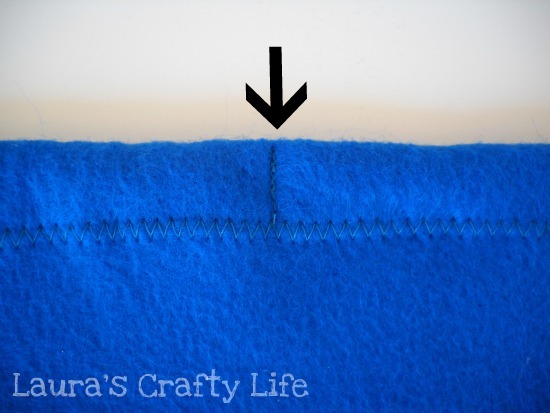 Sew a straight stitch perpendicular to your zig zag stitching in the middle of the hemmed edge. This will keep your ribbon from falling out! The finished stitching will look like this. And here are my twelve capes ready to be put in the treat bags. These techniques will not work with other types of fabrics as they will end up fraying. Although, you could probably use a stretchy knit or fleece without having to take any additional steps. If you have any questions about either of these capes, please feel free to email me at laurascraftylife@gmail.com. My written instructions are not the best, but hopefully the pictures make it pretty clear. Each cape cost me less than $1.00 to make! These made great favors and we ended up having some extras for my kids to have for when we have playdates at our house. great tutorial. Even though I have two girls, they are huge superhero/ comic book fans. I would love for you to stop by and link up your project to More the Merrier Monday. It lasts through Wednesday so you have plenty of time to link up. Thanks for the great tutorials! I used both the capes and masks, using stiffened felt for the masks. I decided to use the same template to cut out (from unstiffened felt) masks, minus the eyeholes, to glue onto the backs of the capes, for an added Batman touch. You were such a help! Glad these helped you! That is a great idea to use the template for the cape! Have a great weekend.